Yuli Turovsky and the members of I Musici de Montréal continue to offer their faithful public the kind of eclectic program that fearlessly crosses the boundaries of period, genre, and content. Classical and Romantic composers (Beethoven symphonies are included) rub shoulders comfortably with those of the twentieth century, especially Russians. It was Turovsky who made the Montreal public aware of Alfred Schnittke. They perform sound track music (the Musici ensemble often accompanies screenings of silent films) as well as "world music" (this season's audiences were treated to the alphorn and the erhu, a traditional Chinese instrument). Some of their repertoire is almost crossover. Last season the Quartetto Gelato joined the ensemble in concert, to the audience's delight. I Musici de Montréal's reputation at home and abroad is bolstered by some forty recordings, which have netted Turovsky and his family of fifteen musicians over 120 concerts annually. This month marks the twenty-fifth anniversary of the maestro's Canadian career. La Scena Musicale interviewed him at home, amid the comings and goings of students and the sound of violin lessons dispensed upstairs by his wife, Eleonora Turovsky, who is first violin of the Musici ensemble. On the walls hung the expressionistic paintings of their daughter, Natalya, also a violinist in the ensemble. "he says. "In any case, no one else was better off." The young Turovsky could escape from harsh reality through the cello, which he began playing at the age of seven, taught by Galina Kozolupova. 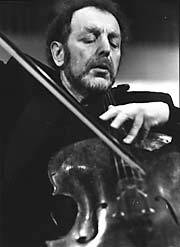 He worked very hard, and in 1969 won first prize at the USSR Cello Competition. The next year he was among the winners of the 22nd International Competition "Spring of Prague." "When you play music," he says, "you have to work hard to get the best offers. Winning competitions is a must; it's the only way to launch a career." He practised for five to eight hours daily, and considers a high pain threshold normal. "I never heard of tendinitis until I emigrated," he says. "Does your hand hurt? Of course! If you practise, you're going to have some pain. But here musicians consult a psychologist, or change teachers, instruments, or strings. With us, strings were so hard to come by that if you had them, you kept them!" Working in such a stripped-down environment, Turovsky developed an exceptionally strong character along with a deep sensitivity. "In an atmosphere where everything is forbidden, you can't speak freely. Art gives you the means to express what you can't say. In my view, this accounts for Russian musicians' greater musical sensitivity. For them, the message is the most important thing. In Russia we never talked about the so-called objective playing. I don't think I ever heard anyone say, "Music says it all," or "You're overdoing it." On the contrary, it was never enough! I know that I'm occasionally accused of imposing my personality on the public. It's my way of expressing my soul and my ideas, and I don't see any harm in it." Yuli Turovsky's intensity spills over daily onto those he meets in his adopted country, whether they be members of the Musici ensemble, students, the public, or friends. He's never wanted to compartmentalize performance, teaching, and conducting. "One area always helps the other. When I teach, it helps my playing because the best way to understand something is to explain it to someone else. When I play, my teaching is of course improved. And teaching provides support for my conducting, which in turn helps my playing because I have a different perspective when I look at my cello score. It makes no difference to me whether I play or conduct." His ability to make aspects of his work mutually supportive shows in the way he approaches repertoire. "When we perform very modern works, we find the experience in classical or Romantic music helpful because the public sometimes has difficulty understanding music in which everything--harmony, melody, and rhythm--is very new. We have to find ways to bring the work closer to what's already familiar to them. If the melody reminds me of Brahms, I emphasize it. This makes the piece more accessible to an audience that has probably been raised more on Brahms than on Stravinsky." 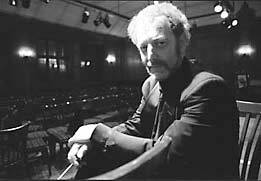 The role of the performer, and by extension the conductor, takes on a whole new dimension when Turovsky speaks, visibly impassioned by his subject. "What is a performer?" he asks. "Is he the servant of the music (an expression that I often hear and that, as far as I'm concerned, I never find sincere). I think the process is much more complex. I would compare the composer and performer to father and mother figures. The composer is the father, but the mother gives it life. Without the performer, there's no offspring. In the same way, a child can resemble more his father than his mother, he remains the offspring of both. This point of view may seem immodest, but, to me, the performer is enormously important, because he (or she) gives birth to it. A score isn't worth much on paper." Turovsky draws another parallel, this time with the theatre. "Why do we go to see Romeo and Juliet? Certainly not to hear something we already know by heart. We go to see what a particular actor will bring to the play. It's the same with music. We know this concerto or that symphony well, so why would we want to hear it again? To discover new insights suggested by the individual performer." Turovsky is so lit up with enthusiasm that it's catching. He demands total involvement from those around him. They must be alive to the sounds they hear and keen to take the less travelled road. "I don't ever want to get in a routine," he says. "My musicians know that each concert may change completely. I don't let myself do a work the same way twice." There's no point suggesting that sometimes being on automatic pilot can save the day. "In my view, the experience must always remain fresh. Another word that I'm fond of using to describe the process is sincerity. In the Moscow Chamber Orchestra we used to say, 'Approach each concert as though you know it will be your last.' I give myself completely to the work and I ask the musicians to do the same, as much in rehearsal as in concert. What you've worked on in your practice room will be transmitted on stage. It's always the music that's important." Young cellist Yegor Dyachkov studied with Turovsky when he came to Canada and has been a member of the Musici ensemble for five years. "A humane and musical school," is his phrase for the experience. Today he feels that this generosity of spirit is probably the finest legacy Turovsky could give him. "He has breathed a dimension into my work that is very important for me, but which is difficult to teach," says Dyachkov. He mentions, among other things, Turovsky's ability to project, his impressive manner, and his outgoingness with the public. "Yuli is always totally committed. He can begin to concentrate on something in a flash, and yet be there for you as well. He's always challenging himself, and almost always rises to the challenge. He knows how to go beyond his limitations and has a wonderfully intuitive teaching manner," says the young cellist, who is now racking up impressive concert engagements and enthusiastic reviews. Turovsky shares his intuitive powers with youth orchestras. After all, when he decided, a bit on a whim, to found "his" string ensemble in 1983, he had drawn on his and his wife's various pupils, both new and old. Theodora Stathopoulos, conductor and founder of the FACE symphony orchestra (FACE is an inner-city special public school devoted to the arts) is not slow to praise Turovsky. "His contribution to music education in Montreal and his impact on the lives of music students are immense," she says, mentioning motivated, grateful students who never have anything negative to say about him. He occasionally comes to conduct practice sessions with individual sections of the orchestra and was guest conductor of the FACE symphony orchestra at its January benefit concert this year. "Everyone loves him," says Stathopoulos. "The musicians in the orchestra aren't novices; they have enough experience to know the real thing from a phony. They play in other orchestras too, some at the professional level, and have met other conductors. What they see in him first and foremost is the ability to communicate with them in a way they can consume and respond. He motivates and encourages everybody while keeping his high standards and insisting on getting them. This to me is a great contribution; coupled with his willingness to always help makes him a rare find." Plans, plans, plans . . .
Ideas are always bubbling up in Turovsky's energetic mind. The coming season seems as dazzling as it is varied. The string ensemble is presenting a theatrical venture for the first time, with Monique Mercure and Albert Millaire in the starring roles. Inspired by Jerome Kilty's delightful comedy, Dear Liar , adapted from the letters of George Bernard Shaw and Mrs. Patrick Campbell, Turovsky rummaged through his personal library and came up with Tchaikovsky's correspondence with Mme von Meck. The maestro also speaks with enthusiasm of a concert next season featuring the St. Lawrence String Quartet in a Montreal premiere performance of R. Murray Schaefer's Four-Forty. On the same evening, the audience will have the thrill of hearing Beethoven's "almost bacchanalian" Seventh Symphony. The ensemble will continue to offer its highly popular concert series at Ogilvy's, where coffee or aperitifs precede music con brio. Yuli Turovsky is a happy man who wouldn't change his lifestyle or the times in which he lives for all the gold in the world. His definition of happiness is simple but sincere: "When I do what I love, I'm happy." And no doubt his audiences will be too.